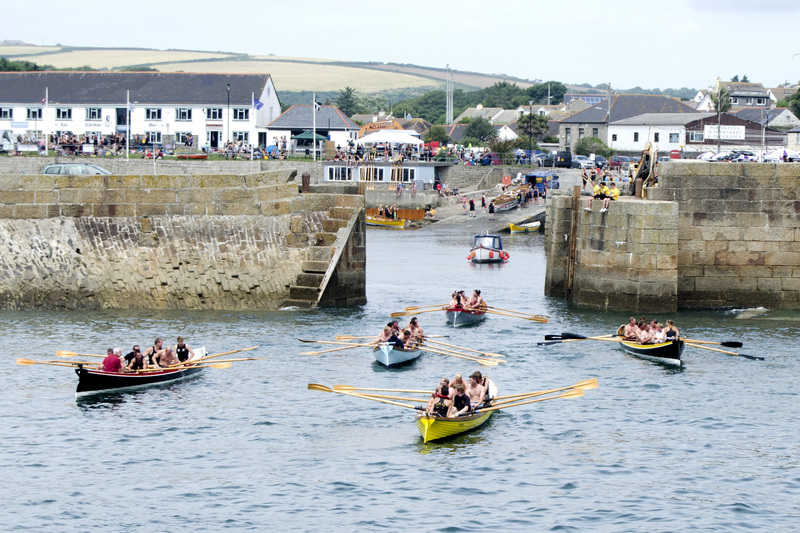 The Cornish Pilot Gig is a fixed seat, six-oared rowing boat. It is built of Cornish narrow leaf elm and measure 32 feet (9.8 m) long with a beam of four feet ten inches (1.5 m). A gig is rowed by six rowers and helmed by a cox, it is recognised as one of the first shore-based lifeboats that went to vessels in distress, with recorded rescues going back as far as the late 17th century. The original purpose of the Cornish Pilot Gig was as a general work boat, and the craft was used for taking pilots out to incoming vessels off the Atlantic. In those days, the race would be the first gig to get their pilot on board a vessel (often those about to run aground on rocks) got the job, and hence the payment. Today, pilot gigs are used primarily for sport, with around 100 clubs across the globe. The main concentration is within Cornwall and the Isles of Scilly, however clubs exist in Somerset, Devon, Dorset, Wales and London. Internationally there are pilot gig clubs in France, the Netherlands, the Faroe Islands, Australia and the USA. All modern racing gigs are based on “Treffry“, built in 1838 by William Peters of St. Mawes, and still owned and raced by the Newquay Rowing Club. The building of new gigs is overseen by the CPGA, the governing body of the sport to make sure that the sport retains its traditions and one class design specifications. The lines of the Cornish Pilot Gig evolved over time driven by the requirements of fast, seaworthy, sturdy vessels for pilotage but it’s story begins much earlier when ‘gig’ was the description for rowing boats built for a diversity of uses around the Cornish coast and the Isles of Scilly.